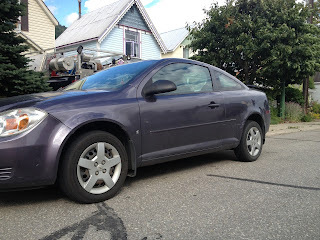 07-15-2013 - Sometime between 11:30 P.M. and 06:00 A.M. on Monday July 15, 2013, an unknown culprit deliberately ran on top the hood and roof of a 2006 Purple Chevrolet Cobalt which was parked in the 600 block of Barry Road in Revelstoke BC. Damage was sustained not only t o the hood and roof, but to the front grill and bumper as well. Cost to repair is estimated at over a $1,000.